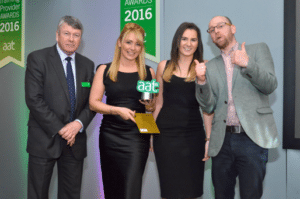 Damar Training, the specialist apprenticeship training provider, has been named AAT Training Provider of the Year (Small) at the Association of Accounting Technicians’ Training Provider Awards 2016. The awards celebrate the outstanding achievements of accountancy students across the country as well as the training providers who deliver the AAT’s accounting qualifications. The awards ceremony was held at the AAT’s Training Provider Conference on Thursday 5 May at the Hilton Birmingham Metropole Hotel. “We were delighted to win this award. It reflects the incredible commitment that I see every day from my training colleagues, our students and their employers. “Successful apprenticeships are down to successful partnerships and I am very proud that we have worked with several of our employers for many years and I hope this will encourage more employers and young people to embark on accountancy apprenticeships with Damar”. In addition to the Provider of the Year win, Damar student, Lisa Cochran from Stockport Truck Centre was shortlisted in the Apprentice of the Year category.